The third film in what I like to dub, “The Da Vinci Series” and like its predecessors it follows a puzzle of mind numbing proportions that only those in the know truly understand. Remember, what you see is not necessarily what you should expect. 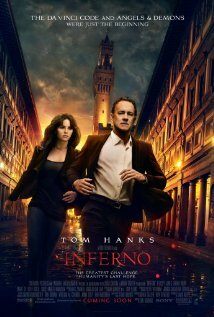 The film starts with a disorientated Robert Langdon (Tom Hanks) and the pretty Doctor Sienna Brooks (Felicity Jones) who come together to solve the puzzle of Robert’s missing memory and just WHAT he has done that he cannot remember. Based around Dante’s Inferno and an over populated world, the film deals with the idea that a disease that kills much of the human population is something positive for us as a species. Frequent hallucinations and flashbacks by Robert lead to a muddled and confusing outlook on what could, initially be seemingly simple. Tom Hanks is ever a superior actor and his portrayal as a mentally confused yet outwardly active is impressive. You can feel that Robert is struggling, even without the frequent hallucinations that make him see the bloods of hell. Felicity Jones is a star, she is strong willed, smart and loyal. This duo make the film intense and a sense of haste is created through the scene changes and time differences. The film is a good, if slightly headache inducing. The quick cuts and changes of lighting can be disorientating and take a minute to adjust to initially. The story is quick paced, energetic and interesting, if confusing. Those who have read the series by Dan Brown will no doubt be able to make sense of it much better than I. A good watch though, if not a must-see.